Since Ratan Tata stepped in as chairman of Tata Sons, the company has become a global force, acquiring international brands such as Corus, Jaguar, Tetley, and Land Rover, broadening its market base at home with new products such as the Tata Nano, and continuing to employ people in more than 22 countries. Tata has built one of the most iconic Indian companies into a global conglomerate while retaining its history and ethics. His business acumen has led him to receive honours from home and abroad: he has been given one of India’s highest civilian awards, the Padma Bhushan, as well as being appointed Knight Commander of the British Empire. 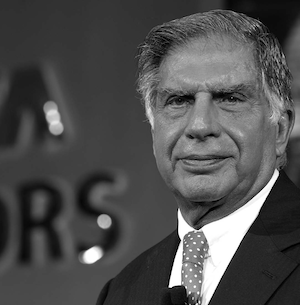 Tata has transformed the company in recent years, making it one of the most recognised brands in the world and establishing him as one of India’s finest business leaders.